1.Follow the recommended instructions for safe installation and anchorage. The bouncers should be away from fences, greenhouses, branches, etc. which could be dangerous for children playing if they fall in during play. 2.Children over 6 years old can use inflatable bouncersl. 3.Before children use the bouncer, they should take off their shoes and eyewear and jewelry. 4.Any sharp objects (pins, keys) should be removed from the hands / pockets before the game begins (they could easily cause injury). 5.Do not let children of significantly different sizes use the game device together. Smaller children are otherwise at risk of being injured by collisions. 6.Do not let adults or children exceed the maximum allowable size / weight on the game machine. 7.food, drinks, bottles, glasses, etc. should not be taken with the game device. 8.The inflatable bouncers should be supervised throughout. 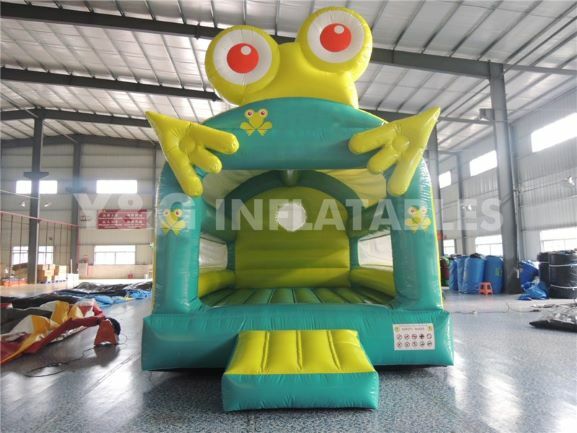 If supervision can not be ensured, the inflatable play equipment should be emptied and removed. Supervision means constant observation and not just presence in proximity! 9.Children should be instructed not to push other children off the inflatable bouncers. Especially falls from higher areas can otherwise lead to fractures. Children should be instructed not to jump against the walls in closed hopping equipment in order to reduce the risk of colliding against each other. Otherwise, injuries may be caused by collisions. 10.Follow the instructions regarding the maximum number of children and Check the inflatable bouncers regularly. If the weather is nice, inflatable play equipment sounds like a fun addition to fun pools, theme parks, restaurants, parties or as a permanent garden setting. Nevertheless, be aware of the dangers of these playground equipment. Make sure that you have taken all measures to minimize the risk of the game device so that fun on the inflatable game does not become a tragedy in seconds. Here's our summary of the safety rules for inflatable bouncers.